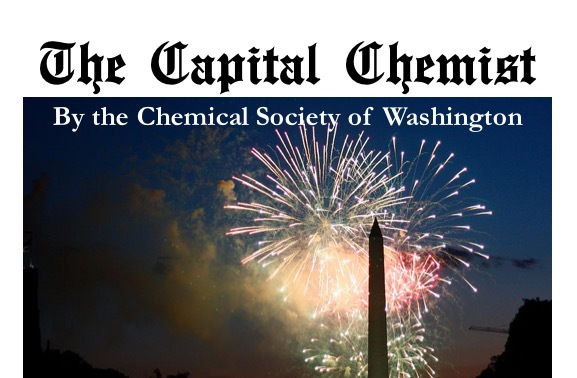 The Capital Chemist is published monthly from September to May, and covers news and events of interest to chemists in the Washington, D.C. metro area. Beginning in January 2011, The Capital Chemist was changed to be primarily an electronic publication. Members who wish to continue receiving mailed paper copies may do so for a fee of $10 per year. Payment of $10.00, in the form of a check or money order payable to “Chemical Society of Washington” should be sent to the CSW office (CSW, 1155 16th Street, NW, O-218, Washington, DC 20036). If payment is received by close of business on January 15, the member will receive all nine issues of The Capital Chemist for the current year. Otherwise, the member will receive all issues for the current year with press deadlines after the date of receipt of the $10 payment (pro-rated price will not be available). 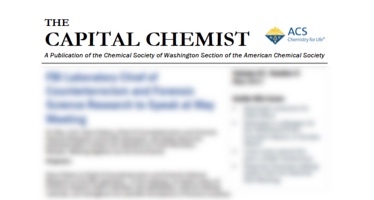 GENERAL: The Capital Chemist is published monthly from January to December (except June, July, and August) by the Chemical Society of Washington, 1155 16th Street, NW, Washington, DC 20036. Subscription price for an electronic subscription is included in all membership fees; mailed paper subscriptions are $10.00 per year. CSW assumes no responsibility for the statements and opinions advanced by the editor or contributors to its publication or the products and services advertised herein.